The 2014 Melbourne Cup has been won by Protectionist, with Red Cadeaux in second, and Who Shot Thebarman in third, with Signoff running fourth. Last place was favourite Admire Rakti, who was hurt during the race and later sadly passed away. The German horse has claimed the Melbourne Cup, continuing the streak of internationals coming to win Australia’s richest race. 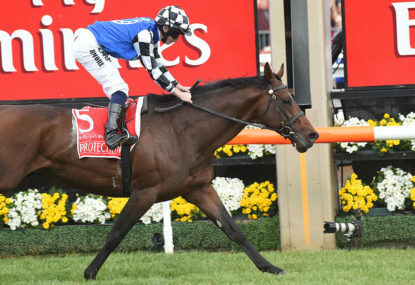 Jockey Ryan Moore had Protectionist positioned nicely around the final turn, and strode through to win Andreas Wohler his first Melbourne Cup, the first by a German horse. For Red Cadeaux, it was the third time he’s run second in four years, but he will be disappointed at not getting a victory in what will surely be his last run in the Cup. My Ambivalent held the lead for much of the race, wanting to run early, moving out to a four-length lead at the mid-point in the race. She tried to set a pace far too fast and compounded badly. It was the second fastest running of the race in 20 years, and the fastest since Media Puzzle won in 2002. Admire Rakti was last – The favourite faded late in the race, after being in reasonable position around the turn. Jockey Zac Purton, concerned for the horse’s welfare, pulled up on the horse and walked it across the line to finish last. Tragically, the Japanese stallion died after the race, collapsing in his stall after returning from the track. It’s a terribly sad turn of events, and his connections will be devastated, as are all admirers of the horse. Rest in peace. You can read the full story on that tragedy here.